In concrete materials, the electrical resistivity is correlated well with important durability parameters such as permeability, diffusivity and in general the micro-structure characteristics of concrete. Giatec RCON2™ provides a reliable method that utilizes electrical resistivity measurement for the quality control of concrete based on the required durability performance. This measurement can easily be made on the same concrete samples that are currently used for the compressive strength testing of concrete. RCON2™ employs an AC impedance technique for the accurate and fast readings that can be continuously obtained using its customizable and user-friendly operating software for various concrete materials. 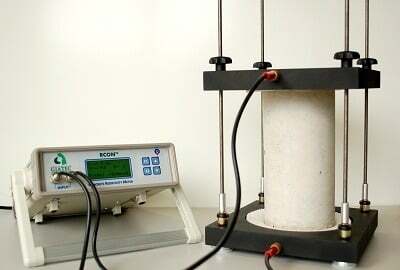 The electrical resistivity of concrete can simply be related to their pore network characteristics such as pore size and their connectivity, moisture content in the pores and pore solution chemistry. In concrete materials, the electrical resistivity has been well correlated with important durability parameters such as permeability and diffusivity. In addition, this non-destructive test can easily be conducted on fresh or hardened concrete specimens at different ages or various stages of hydration in order to study workability, setting and durability performance of concrete. The electrical resistivity method has also been applied to investigate corrosion of rebar in concrete, creep, aggregate segregation and freeze and thaw of concrete since they affect the pore network properties. The concrete electrical resistivity techniques is also a suitable replacement for the Rapid Chloride Permeability Test of concrete (as per ASTM C1202) since there is a strong correlation between the electrical resistivity and durability performance of concrete. New ASTM and AASHTO standards are being developed based on the electrical resistivity measurement of concrete as a measure of its durability performance. Q1: Can RCON2™ be used for field tests on hardened concrete, or is it just for laboratory use? A: RCON2™ is designed to test hardened concrete samples of different sizes and shapes for both laboratory and field applications. Q2: Your website mentions the correlation between ASTM C1202 and the RCON2™. Do you have any data comparing the results of the 2 methods? Q3: What is the measuring range of RCON2™? What is the maximum (kΩcm) that can be measured? A: The measurement range for the RCON2™ is from 1ohm to 1Mohm. For a cylindrical sample of 10 x 20 cm the maximum measurement is ~4,000 kΩcm. This range can be increased to ~40,000 kΩcm using a high-resistivity accessory provided by Giatec. Q4: What kinds of requirements are needed to run the software? A: The requirements needed to run the software are a PC computer with minimum Pentium 4 Processor, Windows XP/Windows 7/Vista operating system and at least 500 MB Ram. Q5: What are the standards that were used to develop the equipment? A: RCON2™ was developed based on an upcoming ASTM standard which will be published soon. There is a similar standard in AASHTO for the surface electrical resistivity measurement, but RCON2™ device measures the bulk electrical resistivity which provides a more accurate result. Q6: Does this device measure compressive strength? A: No, it does not. RCON2™ can easily and quickly measure the electrical resistivity of concrete. This parameter is closely correlated with the setting time of fresh concrete and the durability characteristics of hardened concrete. Q7: Does this device measure the sustainability of concrete and the ingress of salts and chlorides? A: RCON2™ measures the electrical resistivity of concrete. This parameter can be used to estimate the durability and sustainability of concrete in a specific exposure environment. Giatec offers another device called Perma™ which measures the rapid chloride permeability of concrete based on the ASTM C1202. For more information on this device, please click here. Q8: In some countries, the operating voltage is 210-220 V and the cycle is 50 Hz. Is RCON2™ compatible with these specifications? Would this difference of cycles affect the test results? A: The power supply of the RCON2™ supports an input voltage in range of 100-250 V with the frequency range of 50-60Hz. The results wouldn’t be affected at all by these variations. Q9: Is the item D00101A-11 Fresh concrete probe mandatory for performing tests? Will it be useful in supplementing our results? A: The fresh concrete probe is an optional item; it is only needed for studying the setting of concrete. If you are not doing this type of testing, you do not need this item. Q10: How do you measure the change in water content and time of setting in concrete specimen? A: Using the special fresh concrete probe designed to be embedded in concrete, you can measure the water content and the setting time by monitoring the electrical resistivity versus time. The device comes with software that can log the data. However, calibration is required to correlate the change of the electrical resistivity to the actual water content and the setting time of concrete. Q11: Are the ASTM & AASHTO Standards still under development? A: AASHTO standard is already published. You can obtain more information from the AASHTO TP 95-11 document. The ASTM standard which is based on the bulk electrical resistivity of concrete is currently under development and will be published soon. Q12: Is the concrete specimen used in this test cylinder or can we use a cube sample size (150mmx150mmx150mm)? A: You can fit the cylindrical samples with the maximum size of 150mmx300mm and the cubic sample with the maximum size of 100mmx100mm in the regular sample holder that comes with the RCON2™. However, if you need to measure a 150mmx150mm cubic sample, we can customize the sample holder fixture in order to accommodate this size. Q13: How many samples can be tested simultaneously? A: Only one sample can be tested at a time with the current test set-up that we have. However, the test is very fast, taking only 3-5 seconds to accurately process, allowing for many samples to be tested in a short period of time. Q14: What is the list of users of this product? A: Our user list includes several North American, European, Australian and Middle Eastern universities and concrete producers. Among these are universities such as University of Michigan, Carleton University, University of Ottawa, University of Toronto, Purdue University, and United Arab Emirates University. Q15: Do you have a representative or supplier outside North America? A: Currently we do not have suppliers outside North America. We manufacture and ship the devices directly from Canada. Q16: How will the product be taken care of in terms of warranty services? A: Giatec takes care of any service and calibration cost incurred during the warranty period and will provide online unlimited technical support 24/7 to our customers after the warranty period, free of charge. Q17: In terms of sensitivity, accuracy and calibration, can the RCON2 unit be equated or correlated in any way to any chloride diffusion testing of concrete? A: RCON2™ is fully calibrated before shipping and, moreover, comes with a verification kit for the customer to verify the test results from time to time if deemed necessary. The device has been designed to provide high sensitivity and accuracy required for concrete research. CLICK HERE for the RCON2™ user manual that contains more information regarding the accuracy and sensitivity of RCON2™ as well as its calibration and verification procedure. Q18: What is Giatec’s procurement/sales procedure? A: Step 1: We provide a quotation of the device and its accessories to the customer. Step 2: customer sends us a purchase order or an email confirming the prices listed in the quotation. Step 3: We process an invoice in reference to the purchase order and include shipping, handling, and insurance costs. Step 4: Once we receive the payment from customer (either by wire transfer or a cheque in advance) we deliver the product which will take 1-2 weeks (depending on location) from date of payment and include a receipt for your records. Step 5: Follow-up with the customer and assure that the product was delivered successfully and everything is in good condition. Q19: How to use RCON2 for conductivity measurement for fresh concrete ? A: The conductivity of fresh concrete (which is the inverse of its electrical resistivity) can be measured using the fresh concrete probe provided by Giatec or using a similar setup. This fixture incorporates two stainless steel rods (with insulating parts at the ends) embedded in fresh concrete. The rods are connected to the RCON2 device for monitoring the increase in the electrical resistance between them as the concrete sets and hardens. The measured electrical resistance can be converted to electrical resistivity knowing the conversion factor which depends on the geometry of the test container. This conversion factor can be easily obtained by measuring the electrical resistance of a salt solution (with known conductivity) in the test container. Hammond, E., & Robson, T. D. (1955). Comparison of Electrical Properties of Various Cements and Concretes. The Engineer (London), 199(5165) 78-80, and 199(5166), 114-115. Nikkanen, P. (1962). On the Electrical Properties of Concrete and Their Applications. Vaftion Tebsilliren Tutkirndaitos, Tiedotus, Sarja III, Rakennus 60, 75 pages. In Finnish with English summary. Henry, R. L. (1964). Water Vapor Transmission and Electrical Resistivity of Concrete. Final Report. U. S. Naval Civil Engineering Laboratory, Port Hueneme, California, Technical Report,R-314, 39 pages. Tobio, J. M. (1959). A Study of the Setting Process, Dielectric Behavior of Several Spanish Cements. Silicates Zrrdrcsb-iek, 24, 30-35 and 81-87. Power, T. C. (1958). Structure and Physical Properties of Hardened Portland Cement Paste. Journal of the American Ceramic Society, 41(1), 1-6; PCA Research Department, Bulletin 94. Jones, G., & Christian, S. M. (1935). The Measurement of the Conductance of Electrolytes. VI. Galvanic Polarization by Alternating Current. Journal of the American Chemical Society, 57, 272-280. Terry, E. M. (1929). ADVANCED LABORATORY PRACTICE IN ELECTRICITY AND MAGNETISM, 2nd Edition, McGraw-Hill, N.Y., 197. Fricke, H. (1931). The Electric Conductivity and Capacity of Disperse Systems. Physics, 1(2), 106-115. Frcitag, F. E. (1959). (Dyckerhoff and Widmann Kommanditgesellschaf t). Increasing the Electrical Resistance and Strength of Concrete. German Patent No. 1,064,863. In German. See abstract in English in Chemical Abstracts, 55(8), 7798d. Budnikov, P. P., & Strelkov, M.I. (1966). Some Recent Concepts on Portland Cement Hydration and Hardening. SYMPOSIUM ON STRUCTURE OF PORTI.AND CEMENT PASTE AND CONCRETE, Highway Research Board Special Report 90, Table 3, 450. Seligmann, P. (1968). Nuclear Magnetic Resonance Studies of the Water in Hardened Cement Paste. Journal of the PCA Research and Development Laboratories, 10(1), 52-65; PCA Research Department Bulletin 222. Monfore, G. E., & Verbeck, G. J. (1960). Corrosion of Prestressed Wire in Concrete. Journal of the American Concrete Institute; Proceedings, 57, 491-515; PCA Research Department Bulletin 120. Monfore, G. E., & Ost, B. (1965). Corrosion of Aluminum Conduit in Concrete. Journal of the PCA Research and Development Laboratories, 7(1), 10-22; PCA Research Department Bulletin 173. Andrade, C. (2010). Types of Models of Service Life of Reinforcement: The Case of the Resistivity. Concrete Research Letters, 1(2), 73- 80. Bertolini, L., & Polder, R. B. (1997). Concrete Resistivity and Reinforcement Corrosion Rate as a Function of Temperature and Humidity of the Environment. TNO report 97-BT-R0574, Netherland. Bryant, J. W., Weyers, R. E., & Garza, J. M. (2009). In-Place Resistivity of Bridge Deck Concrete Mixtures. ACI Materials Journal, 106(2), 114-122. Buehlef, M. G. & Thurber, W. R. (1976). A Planar Four-Probe Structure for Measuring Bulk Resistivity. IEEE Transactions on Electron Devices, 23(8), 968-974. Butefuhr, M., Fischer, C., Gehlen, C., Menzel, K., & Nurnberger, U. (2006). On-Site Investigation on Concrete Resistivity a Parameter of Durability Calculation of Reinforced Concrete Structures. Materials and Corrosion, 57(12), 932-939. Chatterji, S. (2005). A Discussion of the Papers, ''A Novel Method for Describing Chloride Ion Transport due to an Electrical Gradient in Concrete: Part 1 and Part 2'' by K. Stanish, R.D. Hooton, M.D.A. Thomas. Cement and Concrete Research, 35(9), 1865-1867. Chini, A. R., Muszynski, L. C., & Hicks J. (2003). Determination of Acceptance Permeability Characteristics for Performance-Related Specifications for Portland Cement Concrete. Final report submitted to FDOT (MASc. Thesis), University of Florida, Department of Civil Engineering. Edvardsen, C. (2002). Chloride Migration Coefficients from Non-Steady-State Migration Experiments at Environment-Friendly “Green” Concrete. Retrieved from www.gronbeton.dk/artikler/Chloride%20migration%20coefficients.pdf. Elkey, W. & Sellevold E. J. (1995). Electrical Resistivity of Concrete. Published Report, No. 80, Norwegian Road Research Laboratory, Oslo, Norway, 36 pages. Ewins, A. J. (1990). Resistivity Measurements in Concrete. British Journal of NDT, 32(3), 120-126. Feliu, S., Andrade, C., Gonzalez, J. A., & Alonso, C. (1996). A New Method for In-situ Measurement of Electrical Resistivity of Reinforced Concrete. Materials and Structures, 29(6), 362-365. Ferreira, R. M., & Jalali, S. (2010). NDT Measurements for the Prediction of 28-day Compressive Strength. NDT & E International, 43(2), 55-61. Florida DOT FM 5-578. (2004). Method of Test for Concrete Resistivity as an Electrical Indicator of Its Permeability, 226. Forster, S.W. (2000). Concrete Durability-Influencing Factors and Testing. Farmington Hills, MI. Durability of Concrete, ACI Committee, Vol. 191, 1-10. Gowers, K. R. & Millard, S. G. (1999). Measurement of Concrete Resistivity for Assessment of Corrosion Severity of Steel Using Wenner Technique. ACI Material Journal, 96(5), 536-541. Hansson, I. L. H. & Hansson, C. M. (1953). Electrical Resistivity Measurements of Portland Cement Based Materials. Cement and Concrete Research, 13(5), 675-683. Hooton, R.D., Thomas, M.D.A., & Stanish, K., (2001). Prediction of Chloride Penetration in Concrete. Federal Highway Administration, Report No. FHWA-RD-00-142. Jianyong, L., & Pei, T. (1997). Effect of Slag and Silica Fume on Mechanical Properties of High Strength Concrete. Cement and Concrete Research, 27(6), 833-837. Kosmatka, S. H., Kerkhoff, B., Panarese, W. C., MacLeod, N. F., &McGrath, R. J. (2002). Design and Control of Concrete Mixtures, Seventh Canadian Edition. Cement Association of Canada, 227. Kessler, R. J., Power, R. G., & Paredes, M. A. (2005). Resistivity Measurements of Water Saturated Concrete as an Indicator of Permeability. Corrosion 2005, Houston, TX, 1-10. Lataste, J. F., Sirieix, C., Breysse, D., & Frappa M. (2003). Electrical resistivity measurement applied to cracking assessment on reinforced concrete structures in civil engineering. NDT & E International, 36(6), 383-394. Lopez, W., & Gonzalez, J. A. (1993). Influence of the Degree of Pore Saturation on the Resistivity of Concrete and the Corrosion Rate of Steel Reinforcement. Cement and Concrete Research, 23(2), 368-376. McCarter, W. J., Starrs, G., Kandasami, S., Jones, R., & Chrisp, M. (2009). Electrode Configuration for Resistivity Measurements on Concrete. ACI Materials Journal, 106(3), 258-264. Millard, S. G., Harrison, J. A., & Edwards, A. J. (1989). Measurements of the Electrical Resistivity of Reinforced Concrete Structures for the Assessment of Corrosion Risk. British Journal of NDT, 13(11), 617-621. Millard, S. G. & Gowers, K. R. (1991). The Influence of Surface Layers upon the Measurement of Concrete Resistivity. Durability of Concrete, Second International Conference, ACI SP-126, Montreal, Canada, 1197-1220, 228. Monfore, G. E. (1968). The Electrical Resistivity of Concrete. Journal of the PCA Research Development Laboratories, 10(2), 35-48. Monkman, S. & Shao, Y. (2006). Assessing the Carbonation Behaviour of Cementitious Materials. Journal of Materials in Civil Engineering, 18(6), 768-776. Newlands, M. D., Jones, M. R., Kandasami, S., & Harrison T. A. (2008). Sensitivity of Electrodes Contact Solutions and Contact Pressure in Assessing Electrical Resistivity of Concrete. Materials and Structures, 41(4), 621-632. Nokken, M. R. & Hooton, R. D. (2006). Electrical Conductivity as a Prequalification and Quality Control. Concrete International, 28(10), 61-66. Parrott, L. J. (1994). Moisture Conditioning and Transport Properties of Concrete Test Specimens. Materials and Structures, 27(8), 460-468. Polder, R. B. (2001). Test Methods for on Site Measurement of Resistivity of Concrete – a RILEM TC-154 Technical Recommendation. Construction and Building Materials, (15)2-3, 125-131, 229. Pun, P., Kojuncdic, T., Hooton, R.D., Kojundic, T., & Fidjestol P. (1997). Influence of Silica Fume on Chloride Resistance of Concrete. Proceedings of PCI/FHWA International Symposium on High Performance Concrete, New Orleans, Louisiana, 245–256. RILEM Technical Committee. (2005). Update of the Recommendation of RILEM TC 189-NEC Non-destructive Evaluation of the Concrete Cover (Comparative Test Part I, Comparative Test of Penetrability Methods). Materials & Structures, 38(284), 895-906. Savas B. Z. (1999). Effect of Microstructure on Durability of Concrete (PhD Thesis). North Carolina State University, Department of Civil Engineering, Raleigh NC. Sengul, O. & Gjorv, O. E. (2008). Electrical Resistivity Measurements for Quality Control During Concrete Construction. ACI Materials Journal, 105(6), 541-547. Sengul, O. & Gjorv, O. E. (2009). Effect of Embedded steel on Electrical Resistivity Measurements on Concrete Structures. ACI Materials Journal, 106(1), 11-18. Scrivener, K. L., Crumbie, A. K., & Laugesen P. (2004). The Interfacial Transition Zone (ITZ) Between Cement Paste and Aggregate in Concrete. Interface Science, 12(4), 411- 421, 230. Shi, C. (2004). Effect of Mixing Proportions of Concrete on its Electrical Conductivity and the Rapid Chloride Permeability Test (ASTM C1202 or ASSHTO T277) Results. Cement and Concrete Research, 34(3), 537-545. Smith, K. M., Schokker, A. J., & Tikalsky P. J. (2004). Performance of Supplementary Cementitious Materials in Concrete Resistivity and Corrosion Monitoring Evaluations. ACI Materials Journal, 101(5), 385-390. Stanish, K., Hooton, R. D., & Thomas, M. D. A. (1997). Testing the Chloride Penetration Resistance of Concrete: A Literature Review. Department of Civil Engineering University of Toronto, Ontario, Canada. FHWA Contract DTFH61-97-R 00022. Prediction of Chloride Penetration in Concrete. Stanish, K., Hooton, R. D., & Thomas, M. D. A. (2004). A Novel Method for Describing Chloride Ion Transport due to an Electrical Gradient in Concrete: Part 1. Theoretical description. Cement and Concrete Research, 34(1), 43-49. Stanish, K., Hooton, R. D., & Thomas M. D. A. (2004). A Novel Method for Describing Chloride Ion Transport due to an Electrical Gradient in Concrete: Part 2. Experimental study. Cement and Concrete Research, 34(1), 51-57. The efficiency of RCON allows to test a large number of specimens in a very short period of time. Giatec's technical team provides very efficient and timely support. The RCON device is an amazing tool for the concrete arena. We have successfully used the RCON on a wide variety of projects. It's ease of use coupled with dating relating to permeability helps us determine the appropriateness of concrete mixtures and the impact of the constituents. Giatec makes some great products. Giatec customer sensitivity and attentiveness also sets the bar for the concrete and construction industries. I have and will continue to reccomend the RCON device and Giatec to my customers and contacts in the concrete and construction industry.